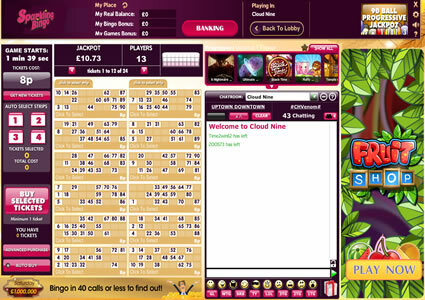 Sparkling Bingo is powered by the 888/Globalcom software, and is one of the many sites that go to make up the Dragonfish network. You would think a site with a name like Sparkling Bingo would be bright and welcoming, so when you land there for the first time, you might be surprised to see a rather dull turquoise and brown colour scheme. Even the logo itself is a rather disappointing affair with a dirty pink look accompanied by a couple of orange stars. The retro television and image of a vintage pin-up add to the confusion, giving the place a bit of a retro feel but not necessarily in a good way. 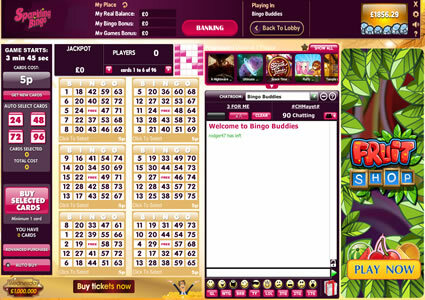 Click on the ‘New User’ link in the top right hand corner of the screen at Sparkling Bingo, and you will be taken to a one screen registration page. You will need to enter your basic details such as your name and address, and you will need to come up with a username. As the site is part of a network this is not as easy as it sounds, especially if you have accounts on multiple sites, you will need to ensure the details you enter are different to those you have used before. You will also need to enter your credit card details, but these are for security and age verification purposes only and no money will be taken until you decide to make a deposit. 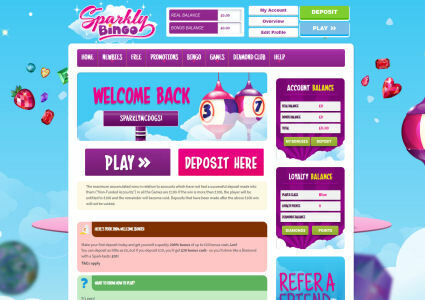 Sparkling Bingo will welcome you with a higher first deposit bonus then those offered by some of the other sites on the network, followed by reloads on all future deposits. They offer plenty of different ways to fund your account too including all major credit and debit cards plus the majority of the secure online payment schemes, making it easier for to keep an eye on your spending. One nice feature is the fact that even if you decide not to wager any of your own hard earned cash, you can still take part in some of their free bingo games and win yourself some bonus money. The Sparkling Bingo lobby is packed full of information, but designed in a way that it does not look too busy. 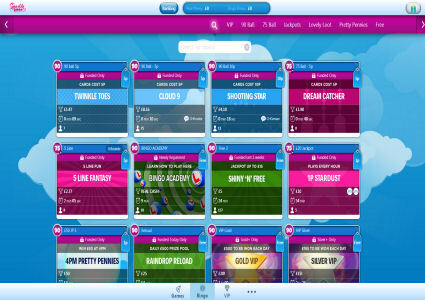 Down the left hand side of the screen you have a series of links leading to all of the different areas including 75 ball bingo, 90 ball bingo, instant games and free bingo to name but a few. Click on any of these tabs and a list of the available rooms will open in the middle of the screen, and it includes all of the information you need to help you decide where you want to play. From this lobby, you can also pre-purchase cards for some of their special events such as Christmas and New Year games. The rooms all use the networks standard layout, but this is no bad thing as it has been tweaked to perfection over many years. The left hand side of the room is dedicated to purchasing and displaying your cards. You can select them one at a time or use the ‘Auto Select Strips’ feature to save yourself some mouse clicks. The right hand side is where you will find the chat room and this has a dual purpose. For a start you can chat with your friends and take part in chat games, but if you need to contact help you can also select the help room from the drop down menu and speak to a CM. There are plenty of guaranteed jackpots to get your teeth into, and they run throughout the day so everyone has the opportunity to take part. They do occasionally give away prizes too, but we have found their tournaments tend to be very long winded, so you end up having to wager a lot to be in with a chance of winning. If you do want to take part in any of Sparkling Bingo’s promotions but can’t get to the computer, don’t worry because there is a mobile version available with apps for both Android and iOS powered handsets. These allow you to log in with your existing log in details and join in the fun regardless of where you are as long as you have a 3G, 4G or WiFi connection. Sparking Bingo is a bit of a mixed bag. If you are looking for lots of guaranteed jackpot games then you won’t be disappointed, but you must remember you are playing against everyone else on the network. Yes they do offer a higher welcome bonus then some of the other Dragonfish sites, but by the same respect you can find higher if you look elsewhere. Sparking Bingo suffers the same fate as many other networked sites, and that is they offer nothing to make them stand out from the crowd. Not only does Sparkling Bingo offer 75 and 90 ball bingo, but also a new variation on the game called High 5 Bingo. With this new game, you win each time you hit a row of five numbers diagonally, across or from top to bottom. They also offer a wide range of slots and instant games, and they all combine attractive graphics with exciting gameplay with the chance to win huge cash jackpots. Sparkling Bingo runs on the 888/Globalcom software and it incorporates a few novelty features such as different dauber shapes and colours. In game options include auto daub, best card sorting and the ability to highlight cards with 3TG, 2TG and 1TG. If you need to step away from the computer for a while, you can use the auto buy facility which lets you set it for a specified number of games, tickets and prices. Sparkling Bingo give away over £6,000 every month through their ‘Free-4-All!’ free bingo games. The great news is there are games for both funded and none funded players, so everyone can join in the fun. If you have not yet made a deposit, you can take advantage of one free bingo games every eight minutes between 7am and 7pm in the Free for All room, and every game gives you the chance to win £1 worth of bonus funds. If you are a funded players though, you can join in the action in the Free Bingo Funded room. This room is open every day between 4pm and 7pm, with free games taking place every fifteen minutes. Each one of these games comes complete with a £10 prize pot, meaning there is £130 up for grabs each day. Sparkling Bingo has a schedule packed full of guaranteed jackpots, and they run throughout the day so everyone has an opportunity to take part. Each evening though, they host five ‘Daily Jackpot’ games, cards cost just 10p each and you can win a guaranteed £100. The guaranteed jackpots do not end there though, because on the 1st of every month there is a ‘Lucky Jackpot’ game. Cards cost just 7p each and the lucky player that bingo’s on the number seven pattern, walks away with £777. If you prefer 90 ball bingo, then make sure you take part in the Mystic £555 that takes place every eleven days. All of the sites on the Dragonfish network share the same promotions with the exception of the welcome bonus which differs site to site. Once you have got past this though, you will find a regular line-up of offers including free bingo, happy hours, a Bingo Friends Forever loyalty scheme and a refer a friend bonus that rewards you every time your encourage someone to sign up and make a deposit. As already mentioned, Sparkling Bingo has plenty of guaranteed jackpots to keep you entertained, but they are also home to a life changing £1 million progressive jackpot that drops with every ball that is called until it reaches a guaranteed level. The network does also add monthly specials to their line-up, but they tend to run over several months with either a big cash jackpot or prizes up for grabs at the end of it.